"The Indiaman Royal George in Three Positions in the Downs," Francis Holman, 1779, Wikimedia Commons. Once again I offer my thanks to Adam Hodges-LeClaire for pointing out a piece I have not yet covered. Thank you! A quick note on the source. I pulled this image from Wikimedia Commons, which itself attributes it to the National Maritime Museum. While the National Maritime Museum does have a digital scan available on their website, it is considerably lower in resolution than the Wikimedia source, and so I am using the Wikimedia version for analysis. The Royal George was constructed in 1777, and embarked on her first voyage in 1778. Sailing for the East India Company under Captain Thomas Foxall, she successfully completed her journey to China and back without incident. 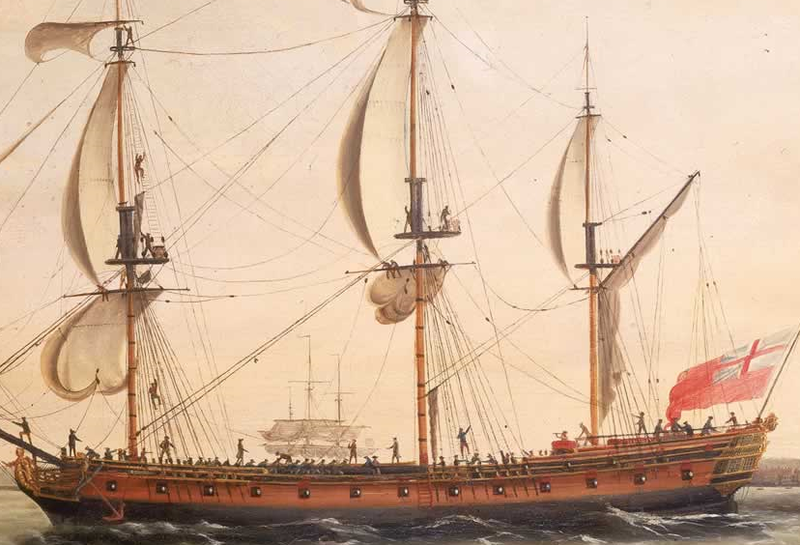 She was not so fortunate on August 9, 1780, when a Franco-Spanish fleet captured her along with 51 other merchantmen, including four other East Indiamen. It was a major blow to the British during the American War of Independence. The Royal George became the Royal Jorge, and served out the rest of her life as a Spanish warship. 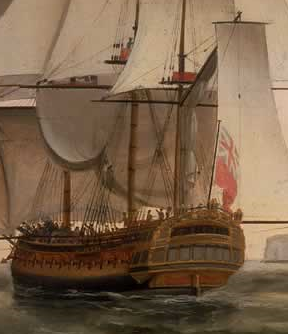 As with most paintings depicting ships of the eighteenth century, there is little detail on the sailors in this piece. They are nondescript blurs of brown, blue, and red. The tars of the Royal George at center are a bit more clear. They wear blue and white trousers, red and blue jackets, and at least a couple of cocked hats. I'm especially fond of the fellow at the rail of the poop who peers through his spyglass. The fellows in the boat are a bit easier to make out. Red breeches and blue jacket with cocked hat, blue jacket and white trousers with round hat, and one oarsman with a brown jacket and black round hat with white trousers.